So its summer and you want the cooling effect of water in the garden, do go for a garden fountains or do you look for something a little different. Water fountains add a sense of tranquility they also attract birds to the garden, and here is what you can build. 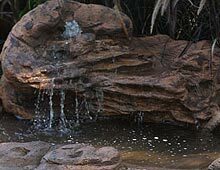 From a water bowl or birdbath, to a pond with a stream and waterfall, garden water features are one of the most popular ideas in garden design. We have come a long way since the days of traditional fountains being the only formal water feature used in a garden. Today you can choose from many 'off the shelf' designs, go for a custom made idea or even 'build yourself' a water feature. So if you have the space and the inspiration, you can make your garden something special with water. 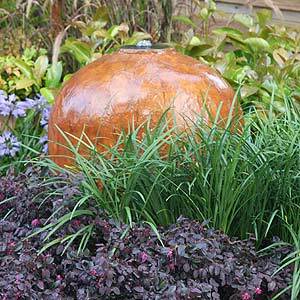 Garden fountains are best when they are built to blend into the landscape. 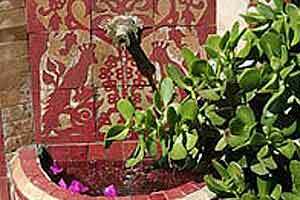 Mounted as wall fountains are the same, theu need to blend in with the overall garden design. 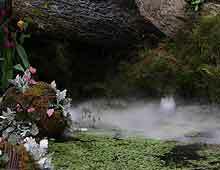 So with a little inspiration you can build a simple water feature. And if you have the money, well you can build the most extravagent fountain you can think of.